Greece has the reputation of being the favorite cruising ground for sailors from Europe and Asia. The Island of Corfu has an abundance of sun, sandy beaches and the clear clean water of the Ionian Sea. It's friendly seaside villages flourish with surrounding hillside olive groves, vineyards and cafes that line their piers. Historic cities, reknown for their strategic position and locus for ancient world trade have created a unique rich Mediterranean culture. Corfu boasts one of the first schools of Philosophy; is the home of current literary giants and the Greek Heroes Jason, Odyssius, Hercules and Achilles. 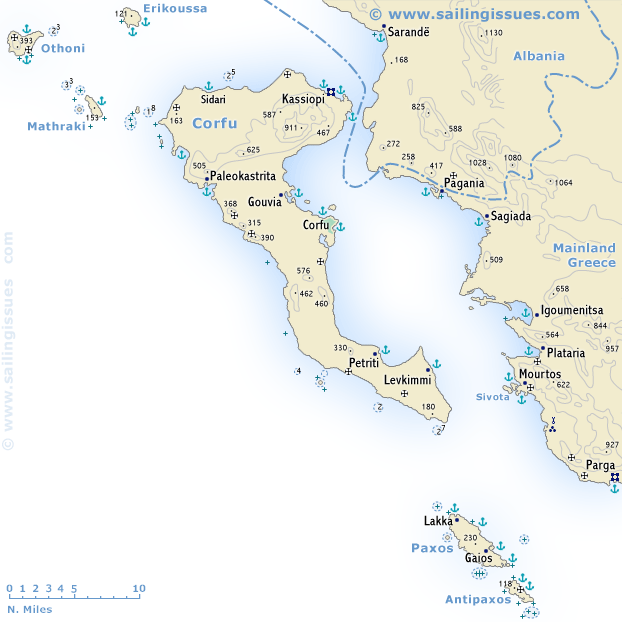 Our Ionian Sea sailing adventure takes us to 14 different anchorages that date from antiquity. With over 42,000 NM logged under sail and a professional sailing Instructor for the past 16 years, I have had the privilege to introduce sailing and certify more than 1650 students on cruising keelboats 24-52 feet and cruising catamarans 38-48 feet. My lesson plans use proven teaching methods that assist my students in acquiring sailing knowledge, sail planning, navigation, marine weather, operational vigilance and boat-handling for all conditions. My favourite C&L destinations are BC's West Coast including Howe Sound, Gulf Islands and Desolation Sound. I also enjoy Instructing Cruise & Learn adventures in Greece, British Virgin Islands (BVI), the Grenadines, Antigua and the Turks & Caicos Islands- 65 weeks in the past 12 years. I am an Instructor for the VSC Heavy Weather Adventure, NauticED Qualified Crew, Coastal Skipper, Bareboat Charter Master and Captain Rank Certifications. In 2017 I sailed the Caribbean & Ionia seas and earned RYA Yachtmaster Cruising Instructor Certification on the Solent, UK and Halifax, NS. 2018 will take my instruction programs to Shanghai China, North and Central coastal BC, the Grenadines, BVI and Texas.